placed by the end of January 2018!! Planning a summer wedding? We have a variety of designs from our Collection that could be perfect for any unique wedding whether its outdoors, in a barn or some fabulous hotel! Let’s not forget those autumnal and winter weddings, such a good opportunity to use darker richer colours to create a warm and romantic atmosphere. Our Love and Co is inspired by vintage typography, printed in white and black ink onto a recycled kraft board. Looking for something a little bit special? Inspired by the opulence of Art Deco with a little hint of Gatsby, our Decodence range is very popular with couples planning a glitzy affair! If you’re looking for Wedding Stationery that is truly unique then our Bespoke service is most definitely for you. I absolutely LOVE designing stationery for our couples, its almost like a mini branding project, it all begins with getting to know you, what you’re about, what makes you tick and what you have planned for the BEST DAY EVER! 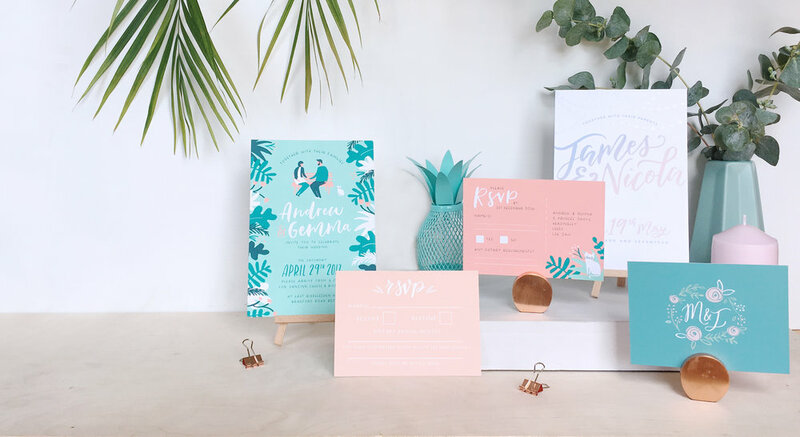 We’ll then compile all of this into a beautifully designed wedding stationery collection, that is totally unique to you and most importantly will wow your guests. Because at the end of the day, your stationery is the first glimpse your guests will get of whats in store for your wedding, so we better make it a good one! This offer applies to any of the designs from the collection and also our bespoke service, the 20% discount is taken off the print cost. We are more than happy to do you a quote. If your order is under £200 we will need the full payment upfront. If the grand total is over £200 then we will ask for a 50% deposit to start work, the rest will then be payable before we post out. So how does it all work? Get in touch here, or by email to info@theoldmarketprintingco.com and we’ll guide you through the process.